After finally tracking down three identical doorknobs, and then spending another 45 minutes browsing all of their other incredible treasures (if you need random crap for your house, Pinterest projects, etc… check ReStore), we headed out the door. Across the street, my eyes (and rumbling tummy) were met by an intriguing new (but apparently, only to me) establishment… Juice Plate. This is where I need to interject. Moms… don’t assume everyone in the world is a creeper. Some people just love babies (umm… everyone in my family) and sometimes these people just need a baby fix. Make someone’s day and let them play with your freaking kid! Lord knows, you need a break anyway! He hopped out of his stroller and onto her lap. She dawned an apron, indicating she worked here. She was friendly and quickly suggested a smoothie he might like. (Super considerate about his diet, allergies, etc.) We got to chatting (babies are great icebreakers) and I learned that she (Pattee) owned the joint! Nothing amazes me more than the incredible people you can meet if you just engage in conversation. Not only does she own Juice Plate, but the Frederick Gorilla (which I love… because they have real articles about real people… people I actually know in real life… which is amazing) is her magazine! I got the “Incredible Hug,” a fabulous green smoothie… and you can’t even taste the kale. Talk about knock you on your tush amazing! 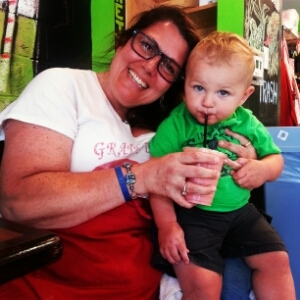 Munchie got a custom smoothie… strawberry, banana, orange… it was rockin’ and he LOVED it!